Astor Place Riot is one of the very first bands that I gave much exploration in my time at WRFL – their album Fine White Line was a collection of songs that featured meticulously crafted contributions from each of the members of the band. 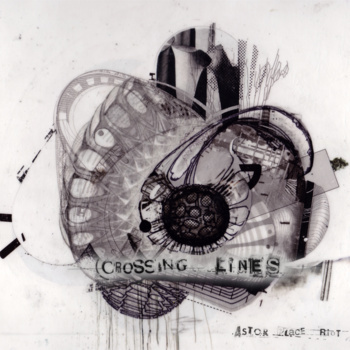 This EP, Crossing Lines, is a continuation of this detailed songwriting practice, featuring five songs of well-paced build and rich cohesion between bandmates. These guys also have a knack for creating a dark, swampy atmosphere with their music – they spend plenty of time exploring minor chords, but don’t let this make their music dreary or bogged down. Songs like “Prevail” and “2against3” groove along with active basslines and involved drum fills that propel the music, rather than allowing it to mope around. Coupling this with the tasteful guitar work and the slinky coloring from the violin, Fletcher’s is able to put across the lyrics they’ve worked out – his voice, and the melodies he choose, are often angular, finding just the right tones of dissonance to make things pop. The production on this EP is also very well done – each person’s lines stand out with great clarity, and give room for all parts to be as effective as possible. If you’re a sucker for text-painting, like I am, you might be a fan of the pairing of bass drum thumps with the lyrics “It’s because of you that I get these thumps at night.” All in all, it’s a great EP from one of Lexington’s younger alternative indie-rock bands, and one that pairs very nicely with the sound they created on their debut LP. Tracks I Liked: Backhand!, In Too Close!! !, Prevail! !, 2against3!! !